Portrait of Eva Hesse, 1966. Ink on graph paper, 4-3/8" diam. Private collection. 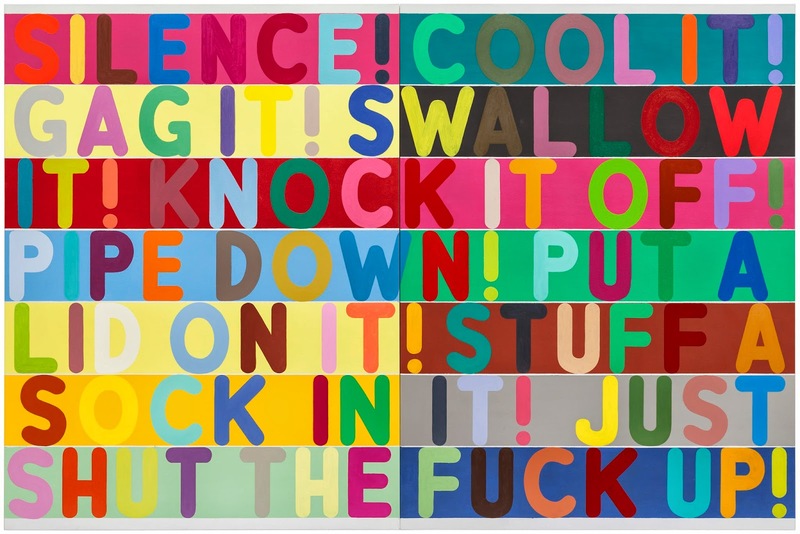 Mel Bochner was playing with the graphic possibilities of language and numbers long before word clouds—and personal computers!—were invented. More than 70 of his works comprise a show at the Jewish Museum titled Strong Language, curated by Norman Kleeblatt and on view through Sep 21. A number of paintings done since the late '90s are included, with a strong representation of his "thesaurus" series, in addition to a series of "Portrait Drawings" from the '60s and 70s of his now famous cohorts. Blah, Blah, Blah (detail), 2008. Oil on canvas, 48"x48". Private collection. It's likeable work that punches all the right buttons—clever wordplay, an array of bright and subtle colors, the tactility of thickly smeared paint, and orderly grids. The thesaurus works, with a nod to Roget's, take one word and parse numerous variations of it, often devolving into off-color slang. He often unearths a phrase you might not have thought of, but there's a sense of predictability and coyness that soon feels comfortable. Silence!, 2011. Oil and acrylic on canvas, 80"x120". Hadley Martin Fisher Collection. With a few works, he moves past that familiarity. 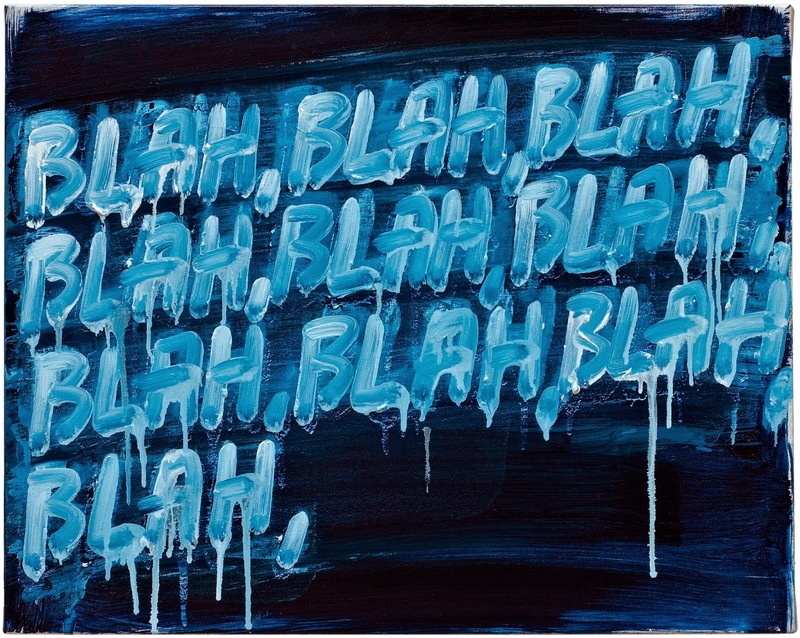 Several "Blah, Blah, Blah" paintings break form with their blasé repetition and deep, immersive shades of ocean blue and layered white scrawls that bleed. They might reveal some jadedness after a career examining the precision and nuance of language, or perhaps the arduous necessity of simply perpetuating one's output. 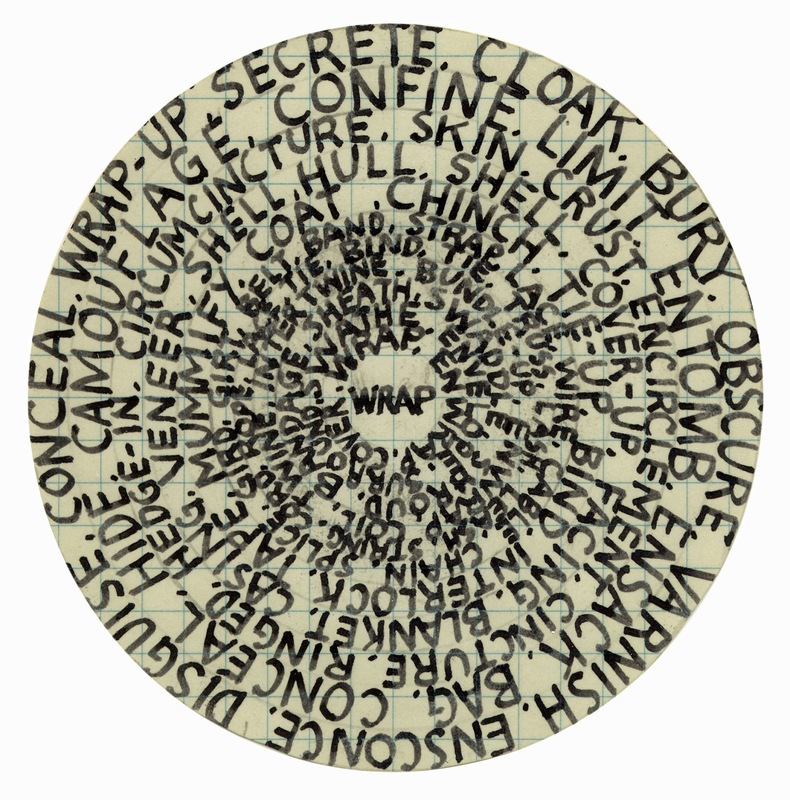 In his early portrait drawings, he shapes words describing the subject's art, or character. And one of the pieces, Dollar Hash Exclamation Plus (2011) which also appears on some of the exhibition's merch, touches on comic book cussing and the foibles of misinterpretation in its symbolic form: $ # ! +. It's a glimpse of work by an artist who has used language both representationally, formally, and with a big wink.